The semi electric bed has a motor to raise and lower the head and the knees at the touch of a button. The height of the bed is adjusted with a manual crank. 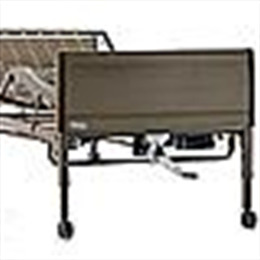 The Invacare impact bed end panels are durable, impact and scratch resistant, and washable for easy cleaning. DC low voltage, compact motor system is fast, quiet, and light weight.